While genuine mahogany lumber exported from Central and South America may be superior to its African counterpart in many ways, African mahogany lumber is still an excellent choice for many projects. 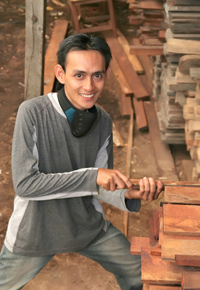 In order to understand how using African mahogany may be fruitful, you should first appreciate its roots. For starters, you should know that the terms “genuine” or “true” being used to refer to mahogany with roots near the Amazon can be misleading: African mahogany is still real mahogany. The mahogany family, Meliaceae, includes two basic genera: Swietenia and Khaya. The Swietenia genus embraces two species: Swietenia macrophylla and Swietenia mahogoni. The first species, Swietenia macrophylla, from Central or South America, is commonly referred to as “Honduran” or “genuine” mahogany, and it tends to have a slightly more orange or brassy hue than other mahoganies. Closely related and still in the Swietenia species group is the Swietenia mahogoni, often called “Cuban” mahogany, which grows in Florida, Cuba, and the Caribbean. Its color is darker, usually a rich reddish brown. Those mahoganies belonging to the second genus, Khaya, find their origins in Africa. This species is often abbreviated as Khaya spp., and it includes these four similar but distinct species: Khaya anthotheca, Khaya grandifoliola, Khaya ivorensis, and Khaya senegalensis. These African species of mahogany have a lighter coloration, more of a salmon or pink tint than their American Swietenia cousins. Swietenia mahoganies tend to be more stable and more costly than Khaya or African mahogany lumber. While vulnerable to beetles, this exotic wood species is resistant to termites and is considered a more affordably priced alternative to Swietenia. African mahogany trees grow in the tropical areas of western Africa, where they can reach 130 feet in height, with trunks 3-5 feet in diameter. 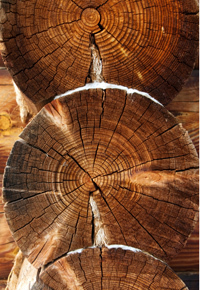 The lumber’s workability and beauty make it a popular choice for plywood, furniture, interior trim, and furniture. It has also been used for cabinetry, musical instruments, paneling, fixtures, and domestic flooring. The beauty of African mahogany is highly dependent on its varied texture, which includes straight, irregular, and interlocked graining. In fact, the unique combinations of graining even have classifications. “Bee’s Wing” African Mahogany boasts a combination of spiral, interlocked grain and small-scale wavy grain that resemble wings of bees. “Ribboned” African Mahogany reflects light, creating a striped effect that resembles ribbons. “Ropey” African Mahogany conjures images of braided ropes, with patterns running diagonally across the board. Another feature that distinguishes African mahogany from many other woods is its luster or chatoyant properties. When finished properly, turned pieces appear to have different colors when moved. If you’re not sure what kind of mahogany is right for your upcoming project, the lumber experts at J. Gibson McIlvain can show you examples of both Genuine and African mahogany lumber and help you evaluate your project’s needs. 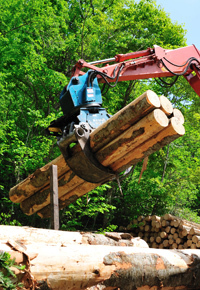 McIlvain has over 200 years of experience as leaders in the lumber industry, so they’re uniquely well-equipped to help answer your questions. For more information and to see McIlvain’s full line of products and services, visit their website today.